Looks like those rumors on T-Mobile supported devices heading to MetroPCS shelves on June 12th were spot on as the company launched a bring-your-own-device service this morning. The service, which supports GSM-based Android phones and specific versions of Apple’s iPhone. The news, which had leaked back on June 4th but was already confirmed by both T-Mobile and MetroPCS execs highlights T-Mobile’s plan to offer more than MetroPCS’ current line of CDMA/LTE hardware with those from its own GSM-based network. The service is now offered in Boston, Dallas, Hartford, and Las Vegas. Plans to expand to more cities will happen in the future. The program supports AT&T and T-Mobile iPhones, and the iPhone 5 from Verizon and Sprint. Also supported are GSM-based Android phones and Windows Phone devices, but not BlackBerry smartphones, or any tablets/mobile hotspots. MetroPCS customers will choose from the company’s current offering of $40/$50/$60 rate plans to use with the devices. In the end, the program is basically a way for T-Mobile devices to activate on the Metro network. There are some limitations to the bring-your-own-device program including: “MetroPCS does not assume any liability for the lack of effectiveness for non-MetroPCS devices,” the carrier wrote on its website. The full list of details is available at the MetroPCS link below. would a t-mobile device, like the HTC one, be able to use Metro PCS LTE ? well does that mean that unlocked devices that are on metro PCS are actually using t-mobile’s HSPA + network? T-mobiles HTC One is using the same bands for LTE on metroPCS as well as their HSPA + so their phone as long as is unlocked will be able to use metroPCS LTE, yes both using Band 4. GSM LTE what soes that mean mostly it will usethe combine radios from T-mobile and metropcs, it really isnt too complicated since T-mobile started to roll out LTE on the same bands as metropcs and AT&T, meaning the phones will just work on any of the network, and metropcs will use T-mobile HSPA+ fallback which is now metropcs anyhow both companies are together so all it matters is the better service right? excited to see T-mobile get ahead of sprint. You wouldn’t want to anyway. Metro’s LTE is significantly worse than even Sprint’s pre-LTE (Wi-Max) “4G”. So with no specifics why even bother to announce it? Maybe one of us blog readers could become CEO perhaps….. Yes you can do that but you won’t be able to use tmobile lte until networks are integrated , but you can only do this if you are in listed cities. So tmobile has technically made a booboo by doing this? I can get same networks for 15 bucks cheaper eventually? Interesting and I’m in no way saying you are wrong but if T-Mobile responds as they did how do you know or where did u get your source? 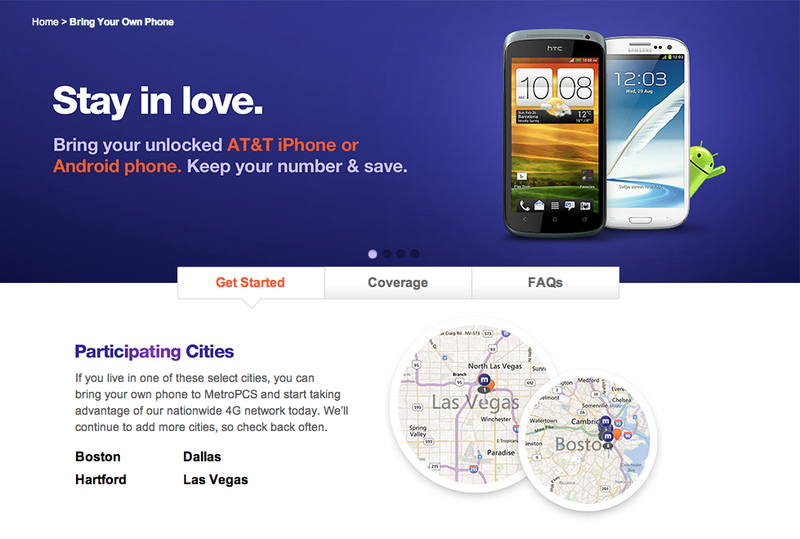 I have read posts on this site for some info and metropcs has this on their site but in basic details. Ok ty. So eventually everyone could take their device to metro, save 15 bucks a month and still have use of both networks. In not sure T-Mobile has fully thought that process through as losing higher paying customers makes no sense. I guess we will see the full picture eventually. actually thats what I thought until I checked the coverage map from the 2 and zoomed in and they were exactly alike, making me think that things should work right away once BYOD becomes available in all metroPCS Markets, of course rumors say by July 1st more markets will have it as well. Everyone that is in a MetroPCS service area, that is. I wouldn’t have this option as I don’t live in a MetroPCS service area. I am going to stay with T-Mobile for 70$ I usually use about16 gb of hspa+ data. well the reason why it probably will is because metroPCS compared to other carriers it’s a profitable company with 0 debt, so I dont see why not if they can keep making money at no loss. I see what you mean and I do understand your point, the main reason why I see that it would not affect T-mobile is because money that metroPCS gets, is money that T-mobile gets which thats good,now since T-mobile went prepaid there are a lot of questions, at first we thought plans from T-mobile will come to metroPCS, but they decided to keep it as is, because customers dont want to have their plan changed, which is fine. all and all we will have to wait and see because nothing is set in stone, things do change. I know they were upgrading metroPCS LTE network with T-mobile to get it at similar speed and well HSPA+ is going to be what T-mobile offers. I’d guess that they’re going to speed-limit 100% of Metro PCS data similarly to the way they do (or is that did; maybe they’ve discontinued GoSmart since the merger) with their “GoSmart” service. Probably not all the way down to 3G but slower than post-paid. Wait I’m confused does that mean a iPhone 4S from Sprint can be used on MetroPCS now? Or do they only mean the iPhone 5 from Verizon and Sprint? Awesome can’t wait until Metro Pcs expands into new markets. However, MetroPCS hotspot does not work on BYODs, according to the store rep, does it? Doesn’t seem to be very competitive compared to the $30 5GB plan. I think I will switch from T-Mobile to Metro and save $10 a month, unless T-Mobile is planning to lower their unlimited $70 plan to $60? T Mobile own’s Merto PCS now. FWIW, MetroPCS hotspot does not work on BYODs, according to the store rep.